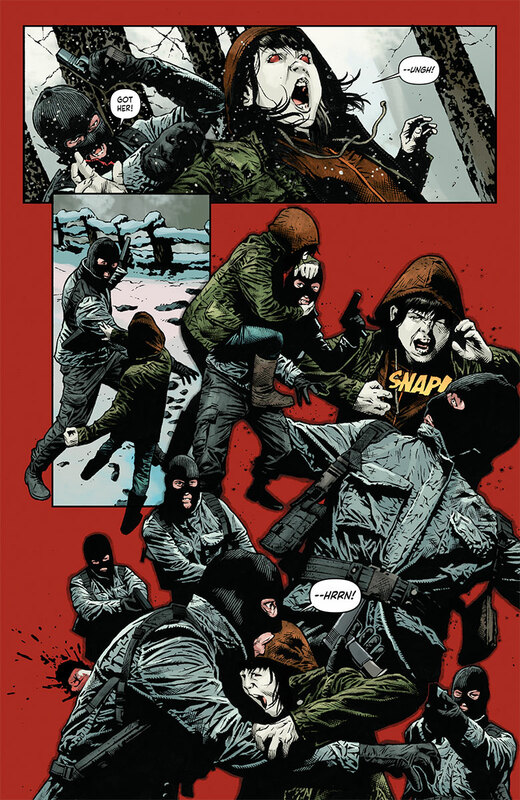 BLOODSHOT SALVATION is a comic that grabs the reader on the first page and doesn’t let go. Iin the very near future, Magic and a fully-nanited girl named Jessie will be on the run from something called Project Omen. At this point, Bloodshot is long dead and according to Magic, he’s never coming back. The story jumps back a few years. 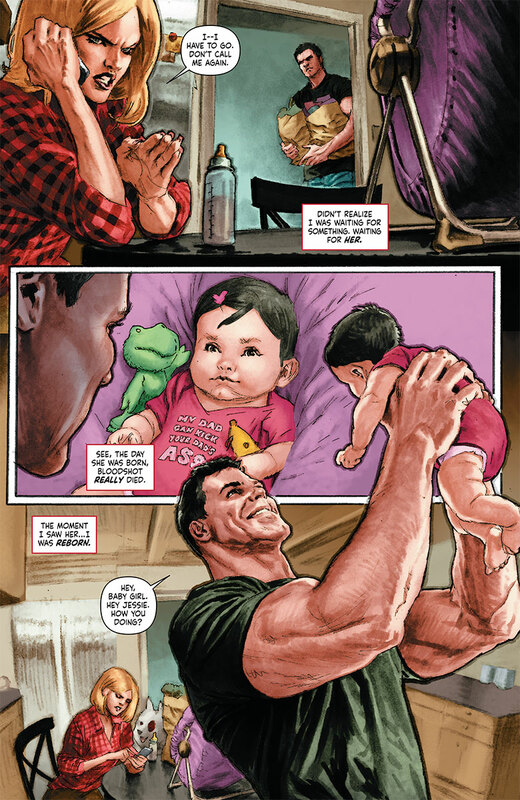 Bloodshot and Magic have been living off the grid with their newborn baby, Jessie. Bloodshot finds out that Magic’s father has been trying to reach out to her. Magic warns that her father is a bad man who runs a cult. She also asks Bloodshot to stay away from him. Bloodshot seems to agree...but when we jump back to the future, we find out that Bloodshot did go after him, and that is what led to his death. Magic and Jessie are attacked by another “Bloodshot, named RAMPAGE! For those relatively new to Valiant, back in the original Bloodshot series in the 90’s, Rampage was his arch-nemesis. We had seen a few teases of this new incarnation of Rampage in various Valiant comics over the last year or so, and now he is making his real debut. Right now, he is stalking Magic and Jessie. The issue did tell us several times that Bloodshot is dead, but I am not quite buying it yet. Jeff Lemire, on the right book, produces some terrific work. If this issue is any indication, I think he is a great fit here. He seemed to hit all the right notes on this one. There was great action and some real powerful character moments. Magic and Bloodshot talking about her father was just brilliantly done. I also loved seeing the change from normal baby Jessie to “lil Bloodshot” Jessie. As far as I know, the “dual timeline narrative” is going to be a mainstay in this series, and it was a great way to tell this story. Sometimes it feels like jumping back and forth is a plot device to hide flaws in the narrative. I had this complaint with SUPER SONS #1 a few months ago. But it worked really well here. It really helped ratchet up the tension when we have a pretty good idea what the consequences of Bloodshot’s actions will be. Along with the great writing, this issue also featured amazing art. Some of the art was pretty close to photo-realistic, especially when showing Magic and Bloodshot’s home life. It was just a terrific look. But LaRosa and Sauyan also drew some pretty intense action scenes too. That is always a tricky balance to pull off well, but the artists succeeded admirably here. Valiant seems to be great at writing compelling first issues. Everything a new reader needs to get caught up is presented in a way to catch them up. And they dig their hooks in early, making you wanna run out and buy the next issue immediately. I complain a lot about badly done first issues, but Valiant is batting close to a 1.000 when it comes to first issues. BLOODSHOT SALVATION #1 is no exception. HIGHLY RECOMMENDED! Makes great use of a split timeline, which can sometimes be tricky. Well...I would be a little bummed out if Bloodshot stayed dead...but that is the only possible negative thing I can think off. Yes! BLOODSHOT SALVATION will be on sale next Wednesday, September 20. Definitely check it out!